Read-out Instrumentation Signpost: Miniature microstepping drive. Applied Motion Products’ STR2-nano microstepping motor drive, available from Mclennan, delivers advanced features for open loop motion control in an extremely compact package measuring just 34 x 35 x 16 mm (length x width x height). With selectable current control from 0.3 to 2.2 Amps/Phase and with a 24 VDC supply voltage, the STR2-nano is aimed at OEM machine and automated positioning applications where space is at a premium but performance cannot be compromised. The STR2-nano has 16 selectable microstepping emulation/resolution settings from 200 to 20,000 steps/rev. Step + direction or CW/CCW pulse control is available and advanced digital current control technology features include automatic idle reduction for improved efficiency and lower heating as well as electronic damping through smoothing and step filters for enhanced anti-resonance and quiet performance. A 30-pin header connector and multiple dip-switches enable easy set-up and installation with no need for software. Built-in safety includes under-and over-voltage protection. The tiny drive has an operating temperature range of 0 – 40 °C and may be heat-sink mounted or fan-force cooled for use higher current and more demanding start-stop performance. A wide selection of compatible permanent magnet microstepping motors from NEMA size 11 to 23 are available with full support from Mclennan. 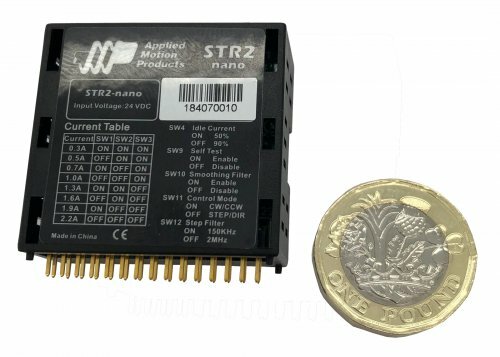 The STR2-nano is a cost-effective drive solution for linear or rotary positioning for use in medical/laboratory equipment, small mechatronic and automated systems, power tools, battery portable instruments and many other industrial and research-based motion control applications where space saving and/or high performance is required.